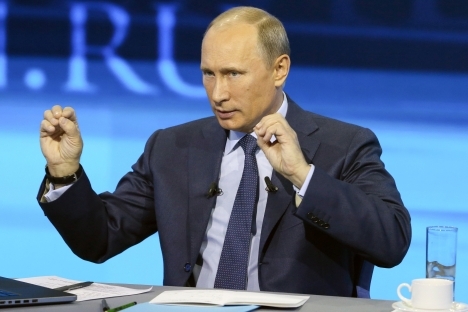 Putin’s televised marathon: One-man show or new approach for dialogue? Russian political pundits speculate on Russian President Vladimir Putin’s controversial image and his approach in establishing a dialogue with ordinary people and political figures through his annual Q&A sessions. Russian President Vladimir Putin’s televised session fueled speculations among political pundits about the future of Russian politics, the President’s controversial image and his approach seemingly aimed at establishing a dialogue with ordinary people. While some pundits argue that the new format of the live broadcasts indicates that Putin is a ready to adjust to the new political reality, others regard his Q&A marathon as a well-orchestrated political show. Vice-President for Center for Political Technologies Georgy Chizhov was surprised by the new aspects introduced by this year's the Q&A session. Chizhov went on to argue that this symbolism, however, has a tint of falsity because it was shown so “vividly” and “purposely” that one cannot help but putting all the show into question, Chizhov said. According to him the new features of the show can be read in two contrasting ways. On the one hand, it might be an attempt to find a new political style and adjust to the new political agenda. On the other, it could demonstrate that Russia’s politics is nothing but a heavy dose of political theater. Political pundit Stanislav Radekevich was also surprised by the format of Putin’s direct line. In reality, Putin will not really get the whole picture concerning the needs of ordinary people if there is a thorough filtration not only questions, but also people, according to Radkevich. Dmitry Orlov, head of Agency for Political and Economic Communication, is instead satisfied with Putin’s televised session and his new communicative approach to people. “This direct line with people was [a great deal of] pressure for Putin, he endured this blow and this was in the spotlight,” he said. In his opinion the show presented a challenge for the President who was bombarded with both convenient and inconvenient questions that came from both high-profile figures and ordinary people. However, other Russian experts are not surprised by Putin and argue that his behavior was quite predictable. In contrasts, Yuri Korgunyuk, an expert from the Moscow-based INDEM think tank believes that Putin “just demonstrated that he was not afraid of being another Lukashenko [Belarus President],” introducing himself as an authoritative leader who controls everything. “It cannot be surprising for me,” the expert said. Almost all pundits agreed that Putin’s debate with Alexei Kudrin indicates that he may not be quiet satisfied with the work of the government and he might be looking for an eligible person to tackle domestic economic problems.